We’re here to provide people affected by cancer with the information and support you need, when you need it. You can browse through the various services we offer below, but if you have any questions or can’t find what you’re looking for, you’re very welcome to give us a call on 01872 256363 or come in to The Cove to see us. If you’re affected by cancer, there’s likely to be many, many things weighing on your mind. 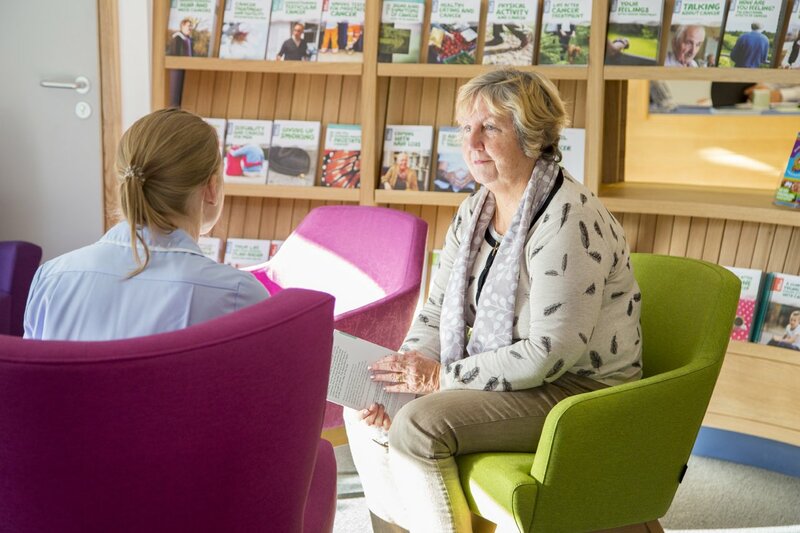 We offer face-to-face support where you can discuss any concerns you have, such as the emotional effects of cancer, its impact on relationships, advice on how to talk to loved ones, and many other subjects on living with cancer. We also have an excellent selection of booklets and leaflets to guide patients through their journey, including information about specific cancer types, various treatments, symptom control, diet, welfare and benefits, relationships, travel, living with, and beyond, cancer and local and national support agencies. You can access this information by coming to visit us at the Cove. There’s no need to make an appointment, volunteers will always be on hand to talk to you and help you find the information you need. The Macmillan (Citizen’s Advice Cornwall) Benefits Advisors are available at the Cove to offer advice about which benefits you may be entitled to. They can also help you complete forms and support you during appeals processes, as well as signpost you to other services who may be able to support you. If you’d like to book an appointment with the Macmillan Benefits Advisors please contact the Cove on 01872 256363 or pop into the Cove and speak to one of the staff. 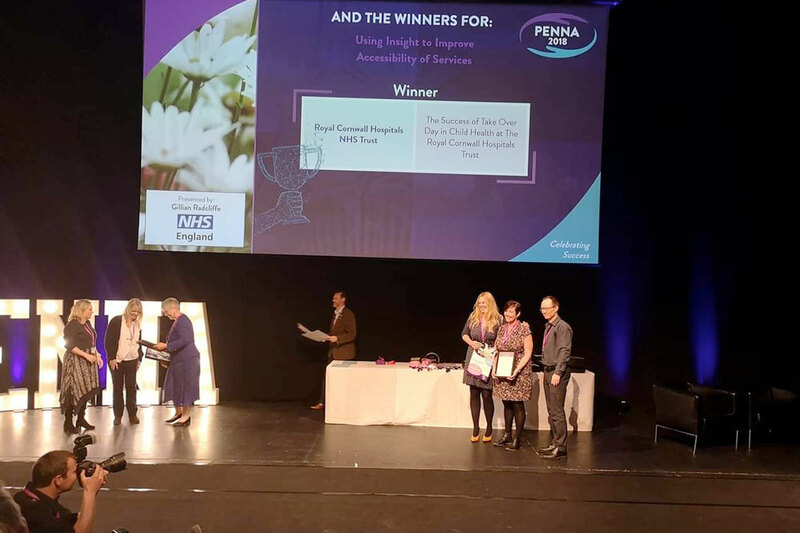 Psychological care and counselling are highly effective in helping you deal with a cancer diagnosis, and the physical and emotional effects of living with cancer. We can also support your family members anytime through your cancer journey. If you think this may be helpful to you or you’d like to find out more about the service, please speak to any member of The Cove staff or your Clinical Nurse Specialist. If we both feel that we can support you (or a member of your family), we will invite you in for an assessment where we can discuss your needs and the most appropriate types of support and treatment. Based on your assessment, we may offer you a series of sessions on an individual, couple or group therapy basis. These sessions will either take place at The Cove, or, if you’re an inpatient, on the ward. Evening appointments will be available if you’re unable to attend appointments during the day due to work or family commitments. This service is free and confidential. During your therapy, you will have the opportunity to talk about how you are feeling and coping. We can also provide information about various, proven self-help techniques that can minimise side effects of treatment and enhance your quality of life throughout your cancer journey and beyond. 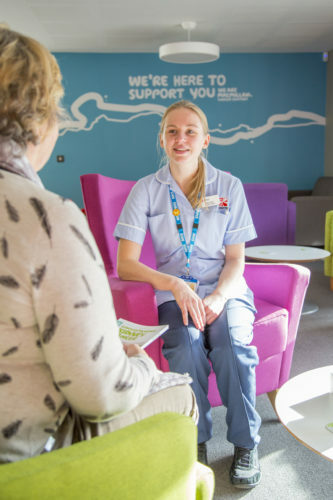 Referrals to the service are generally made through your clinical team (including your Clinical Nurse Specialist) but specialist staff within The Cove Macmillan Cancer Support Centre can also refer you. If you have questions about food choices, or are struggling with weight changes, poor appetite or eating problems, the Cove Nutrition Advice Service is here to support you. People living with cancer and/or haematological conditions often have many questions about their diet. There is plenty of information in the media and online, but it can be difficult to know where to start and what to trust. We offer one-to-one dietary advice drop in sessions on Friday mornings at the Cove. These sessions are run by NHS Registered Dietitians. Depending on your individual situation, we may see you just the once, or advise you to come back for one or more review sessions. You can book a session in advance, or just drop in on the day. To pre-book an appointment either call the dietitians on 01872 258326 (You may get the answerphone, in which case leave a message and we’ll call you back) or email rch-tr.dietitiancornwalloncology@nhs.net. What happens at your session? First, we’ll take time to find out about your concerns and your reasons for seeking advice. We’ll ask questions about your medical history, lifestyle, treatment plan, symptoms you are experiencing, and your diet. We may also take measurements such as your weight. 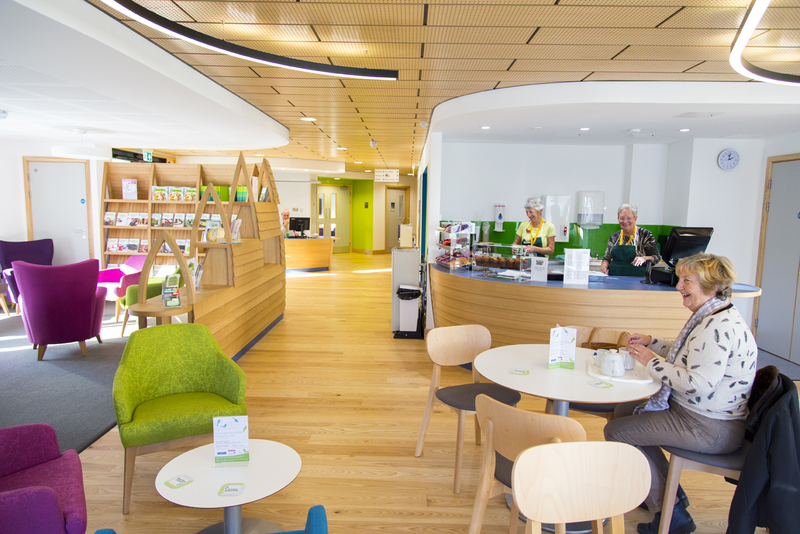 Then we’ll consider your individual nutritional needs and give you tailored dietary advice and information, as well as written information to take away with you. Some people require nutritional supplements that need to be prescribed as part of their care. We can discuss with you but we may need to contact your GP or Consultant to recommend these. We’re happy to provide general information on diet and nutrition to relatives/carers, but we can only discuss individualised advice directly with the patient. Our friendly café is open for the purchase of light snacks and drinks from 9.30am to 4.30pm Monday to Friday. You’ll find a selection of sandwiches, salads, crisps, cakes, biscuits and hot and cold drinks, all from fresh local produce and suppliers wherever possible. The café opens directly onto a peaceful, landscaped patio area with tables and seating, perfect if you prefer some fresh air. Next to the cafe, you’ll find a more relaxed area with comfortable sofas and armchairs and a small children’s area with toys and children’s seats. Patients, carers, friends and relatives, volunteers, visitors and staff are all most welcome. The Cafe is open Monday to Friday, 9.30am – 4.30pm. For many patients the loss of hair as a result of cancer treatments can add to the distress and discomfort they are already experiencing. We offer several services to help you look good and feel better. We offer a confidential, discreet and personalised hair loss consultancy service, run by highly experienced and compassionate advisors. We have an extensive selection of wigs to choose from, which we can help fit, and provide a complete aftercare service. Sessions take place in one of our lovely, private therapy rooms every Tuesday. We can also arrange a home visit. You are welcome to bring a friend or partner to your appointment if you wish and first appointments usually last for around an hour. The option of wigs will be discussed with you at your Chemotherapy Pre-Assessment appointment where they will explain the voucher process that enables you to have a contribution from the NHS either to pay for, or put towards a wig of your choice. How to book an appointment with the Wig Service. To book an appointment please phone 01822 610292. Alternatively just speak to a member of staff at The Cove, or on Lowen Ward or the Headland Unit. Our free Hats and Scarves service, run by a team of Cornwall Hospice Care volunteers, offers friendly advice and practical tips on how to wear scarves, to help you feel more confident and comfortable with your body image. Volunteers will show you how to wear and style your headwear and can even recommend suitable items for special occasions, such as weddings. We also have a selection of hats, scarves, bandanas and turbans available to buy. There is a drop in session at The Cove every third Tuesday, and you can also contact the hospice on 01726 65711 (Mount Edgcumbe) or 01736 759070 (St Julia’s) direct to arrange a specific one-to-one consultation. We run a free make-up workshop, called Look Good…Feel Better, on a monthly basis (alternating between The Cove and St Michael’s Hospital in Hayle). The sessions are run by trained beauty professionals who volunteer their time and expertise to help women combat the visible side effects of treatment, some of which can dramatically change their appearance and body image. These relaxed and friendly sessions (which are held in private in one of our lovely rooms) provide hints, tips, and even some free cosmetic samples, that will help you to look and feel better throughout your cancer journey. If you are interested in attending one of these sessions, please speak to one of the team during your visit to The Cove or ask your Clinical Nurse Specialist to refer you. Please contact the Cove for details. The Cove is home to a number of cancer patient support groups, where people dealing with a particular type of cancer, or similar issues, get together to provide a safe place to share your feelings and challenges, and hear from other people facing similar challenges. Please ask one of the team at the Cove for details of any relevant support groups. We have rooms available for use by cancer patient support groups that are directly affiliated to the Royal Cornwall Hospital. If you’d like to book one of our meeting rooms, please call on 01872 256363 or email thecove@nhs.net. If you need help, advice or support on your cancer journey come in to see us at the Cove anytime between 9.30am and 4.30pm Monday to Friday, or call us on 01872 256363.